9/48 Les Winan Everything in a biopic that Ray wasn't, with a lead performance that's almost as good. 19/55 Reagen Sulewski The most shocking thing is how little of Scorsese there is in this Scorsese film. Maybe that's why I like this one. Over the last few years, numerous Howard Hughes biopic ideas have been tossed around, with many different star/director combinations. 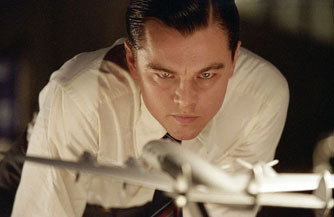 Many never even got off the ground, but the team of Martin Scorscese and Leonardo DiCaprio strike first, and bring The Aviator to theaters this December, clearly with Oscar on their minds. Young Howard Hughes took the small fortune he inherited from his father's Texas business to a fledgling Hollywood. There, he was behind films such as Hell's Angels, The Front Page and Scarface, as well as starlets like Katherine Hepburn (Blanchett), Ava Gardner (Beckinsale) and Jean Harlow (Stefani), all of whom he dated at one point or another. He eventually came to own RKO Studios. But with the film's title being what it is, the focus of the film will likely be Hughes' obsession with airplanes. Hell's Angels, which he wrote and directed, dealt with World War I aviators. While filming it, he earned his pilot's licence. During the 1930's, Hughes set numerous air speed records, and is credited with numerous technological improvements in the field of aviation. The number of big names in this production is astounding, and with an over $100 million budget, it's clear Miramax is serious about making this a serious contender come next awards season.